Apple Car Play was released in 2014 and allows drivers to access the phone, messaging, audio and navigation features of their iPhone’s from their car, without taking their hands off the steering wheel. 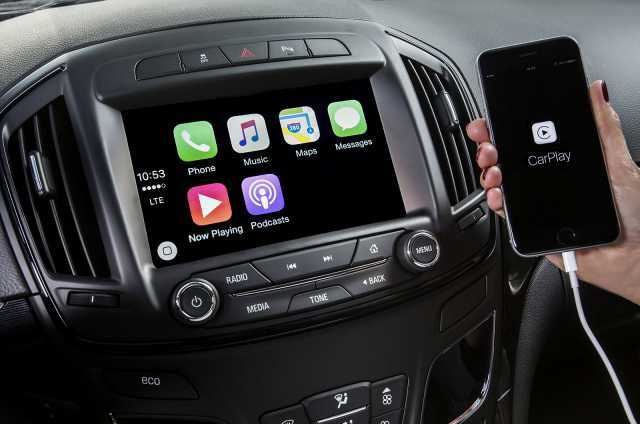 Apple CarPlay is a system which allows your iPhone to connect to your car, allowing you to view content from your iPhone on your car’s infotainment screen. The system also means you can make calls, listen to music and compose messages from your iPhone without taking your hands off the steering wheel. Users connect their iPhone to the car using a USB port, although it’s likely that connections using Bluetooth or wifi will be available in the future. As well as Apple’s own iPhone, messaging, iTunes and Maps apps, third party apps including Spotify, Audible and Stitcher are currently supported, with that list expected to grow as the technology develops. Drivers control Apple CarPlay in the same way as they would the car’s own infotainment system, by using buttons, steering wheel controls and touchscreen. As well as this, Apple’s Siri service allows drivers to issue voice commands, including dictating messages to be sent via the iPhone. The system can also read incoming messages. Apple CarPlay is available on more than 100 different car models from 40 brands including Audi, BMW, Citroen, Fiat, Ford, Honda, Hyundai, Jaguar, Kia, Land Rover, Mercedes-Benz, Nissan, Peugeot, Porsche, Renault, Seat, Skoda, Toyota, Vauxhall, Volvo and Volkswagen. Among the cars which feature Apple CarPlay functionality are the new Audi A4, which we recently crowned as the What Car? Car of the Year for 2016. Other models supporting the system include Volkswagen Golf, Passat and Touran, the Seat Ibiza and Leon, the Mercedes-Benz A-Class, B-Class, and E-Class, and the Volvo XC90. Yes, you can buy aftermarket units which will allow you to enjoy Apple CarPlay functionality in an older vehicle. Suppliers including Alpine, Kenwood and Pioneer all sell units, with prices ranging from around £330 to slightly less than £500. Apple CarPlay is available on any iPhone which comes with a ‘lightning’ charging cable. That means the iPhone 5, iPhone 5c, iPhone 5s, iPhone 6, iPhone 6 Plus, iPhone 6s and iPhone 6S Plus are all supported. Expect future versions of the iPhone to support Apple CarPlay, too. To use Apple CarPlay, your iPhone must have iOS 7 or newer.